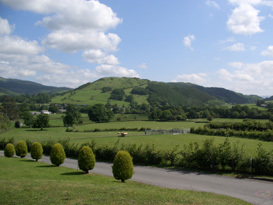 The Bungalow is situated on the outskirts of the village of Pennal in the stunningly beautiful Dyfi Valley. Pennal is 4 miles from the historic market town of Machynlleth to the east and 5 miles from the pretty coastal resort of Aberdovey to the west. The Dyfi Valley is situated in the heart of Wales, just on the southern border of the Snowdonia National Park. FROM NORTH from M6 take M56 to Chester. From Chester take A483 through Wrexham and onto Welshpool.At Welshpool take A458 to Machynlleth. FROM MIDLANDS from M6 towards Telford and Shrewsbury, then onto the A5 to Shrewsbury. At Shrewsbury go onto A458 through Welshpool and onto Machynlleth. Check:- http://www.frixo.com for up to date road traffic information. AIR: Birmingham Airport 110 miles. The stations at Machynlleth, Borth and Aberystwyth are on the main Euston line, which passes through Birmingham New Street and Shrewsbury every two hours. For the Talyllyn Railway join the Cambrian Coast line at Dyfi Junction, this takes you to Tywyn along the magnificent estuary. Contract Work Airport Transfers Disabled Access Vehicles Courier Service - Small/Large Distance No Object 4 To 16 Seaters.